September 11, 2018 at 11:46 am. STILLWATER, Okla. — Boise State rolled for a school-record 818 total yards in its last game, climbed to No. 17 and is making a strong case out of the blocks to be a Group of Five member worth considering for the College Football Playoff. That case could strengthen on Saturday when the Broncos travel to Oklahoma State to meet another 2-0 team, the No. 24 Cowboys. As prolific as Boise State has been, particularly in its 62-7 rout of Connecticut last week, Oklahoma State actually leads the country with a 674.5-yard offensive average. Boise State ranks fourth (617.0). The team that counter-punches most effectively seemingly has the best chance. Boise State certainly has made the most of these opportunities in the past. The Broncos are 2-1 against the Big 12. Each previous matchup came in the postseason, including the 43-42 overtime thrill ride they claimed against Oklahoma in the 2007 Fiesta Bowl. Since 2000, Boise State is the winningest major-college program with 199 victories. It stands 13-16 all-time against ranked opponents but has won three of its last four. The Broncos have just three wins in 17 road games against Power Five opponents but has won two of their last three, at Virginia (2015) and Oregon State (2016). Clearly, no stage is too tall. No light too bright. Senior quarterback Brett Rypien has passed for 667 yards and seven touchdowns with no interceptions, while completing 41 of 56 attempts. He will face an Oklahoma State defense still responding to schematic changes made by new coordinator Jim Knowles. As well as Rypien has distributed the ball, one of his top weapons, sophomore wide receiver Octavius Evans, has been out with an injury. He is expected to make his season debut against the Cowboys. Same for senior defensive tackle David Moa. The Oklahoma State run game has been unspectacular, despite the presence of last year’s Big 12 rushing leader, junior Justice Hill. 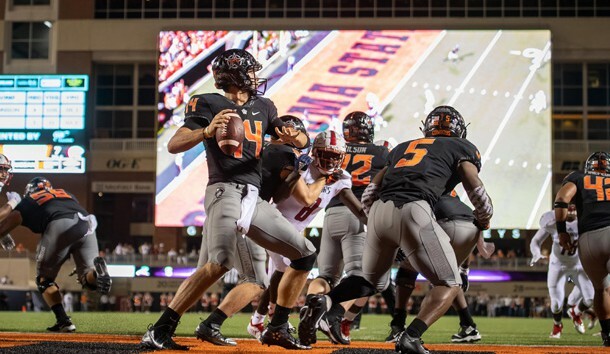 Hill carried just nine times for 32 yards against in a 55-13 romp over South Alabama, but Gundy admittedly was sparing his standout back from wear and tear. Backup J.D. King also gained 32 yards on nine attempts. The numbers make Oklahoma State appear well-oiled. However, Taylor Cornelius, a fifth-year senior in his first season starting at quarterback, will be facing his biggest test. He was sacked three times in the South Alabama win and was under duress on an interception he threw. Although Cornelius has looked mechanical at times, he was still productive in his first two starts, though the opposition was indeed light. Against South Alabama, two promising receivers emerged with 100-yard breakouts. Sophomore Tylan Wallace caught 10 passes for 166 yards and sophomore Tyron Johnson added five receptions for 137 yards to give the Cowboys more dimensions within a deep receiving corps.